One of the world’s most renowned automotive companies, German company Daimler Group is set to relocate the office location of one of its important facilities in Asia Pacific, Daimier South East Asia Pte Ltd from Centennial Tower in Marina Centre, to Westgate Tower which is situated just right next to Jurong East MRT Station. According to market watchers, shifting out of the central of Singapore to the Western part has clearly indicated the intention of cutting down on operational cost for most corporates. In Daimler Group’s situation, they will be paying a monthly rental for an approximate of S$6 per square foot (psf), which works out to be around 30% lower than what they would be paying for a lease renewal at Centennial Tower when their current lease expires on 1st quarter of 2016. The move underscores the importance of saving in occupation cost for corporates, say market watchers. Daimler is expected to pay about S$6 psf in monthly rent at Westgate Tower, which would be about 30 per cent lower than what it could have expected to pay had it renewed its lease at Centennial Tower, which is said to expire in the first quarter of next year. The German company, also owner of luxurious automotive brand Mercedes-Benz, will be occupying a total space of estimated 55,000 square feet (sqft) at Westgate Tower, spreading across about 3 and a half storeys. This results to an occupancy rate of more than 90% at the commercial building. Tenants in this building includes corporates such as CPG Corporation and Beca, who are set to move out from prime central locations of Novena and Anson Road respectively. 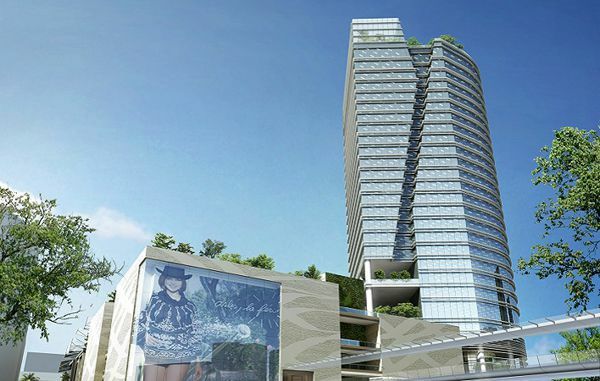 Great Eastern Life will also be joining them at Westgate Tower. As mentioned by Marcus Loo, Savills’s executive director for commercial section, the reduction of cost is the main factor to attrach real estate occupiers in the present business conditions. Ever since the annoucement that Jurong East will be where the High-Speed Rail terminus will located, it has significantly increased the strategic appeal of Westgate Tower, making it a more feasible option for businesses when factoring cost of rental space into the whole picture. Not only being strategically positioned, Westgate Tower stands tall at 27-storey and has also been awarded the BCA Green Mark Platinum award. It is a brand new commercial building which was only completed in October 2014, comprises of Grade A rating office spaces found from Level 6 to 25. Each office space allocated is approximately 8,700 to 8,800 sqft, which are situated on Levels 6 to 8 and larger ones on Level 9 to 25, with approximate size of 15,855 to 16,700 sqft. We could be seeing a trend of multinational corporations (MNCs) shifting out of central locations to effectively bring down running cost on office rental. In recent years, we’ve already seen how The Metropolis (situated next to Buona Vista MRT Station) has brought in major corporate tenants such as Shell, General Electric (GE) and Procter & Gamble (P&G). The next MNC on the radar being watched is possibly Google, who are currently operating in the Central Business District, at Asia Square Tower One. They are expected to move westwards to the MapleTree Business City II as it offers them a larger space and possibly at a lower cost. The main attraction could possibly be the campus-like setup which suits Google’s style of operation.